Certina Kurth Frères SA was founded in 1888 when Adolf and Alfred Kurth opened in Grenchen their first movement and supplies factory for the watchmaking industry. At the start Certina's staff consisted of three employees working in a workshop that was connected to the family home. 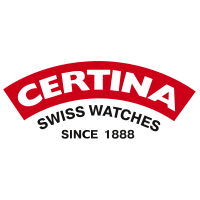 Certina did not begin producing complete watches and timepieces for a few years which they then did alongside their work producing movements for other companies. By 1938 the company had expanded and 250 employees celebrated the 50th anniversary of the company. At that time Certina were already known as pioneers. Recent collection of Certina include Titanium, 316L high grade stainless steel, sapphire glass, its own DS feature (such as the current "DS Podium", "DS First" or "DS Action") and ETA Swiss made movements are standard features. It currently offers collections, classified under the names "Automatic", "SPORT Classic", "SPORT Elegant" and "SPORT Xtreme", including some models claimed to perform up to 100 m underwater. Certina Club 2000 Automatic .Rare Swizz made , working .In original case .